KNOXVILLE, Tenn. (AP) — Tennessee women’s basketball coach Holly Warlick has received a three-year contract extension as well as a $25,000 raise. 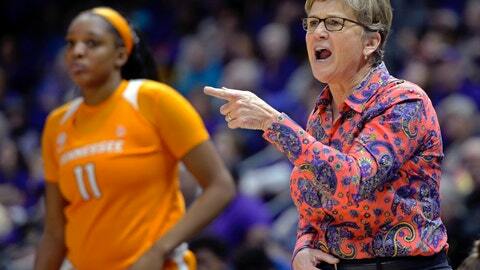 Athletic director Phillip Fulmer announced Friday that Warlick’s contract now runs through the 2021-22 season. Warlick’s deal was set to expire at the end of the 2018-19 season. Tennessee has gone 153-54 with three regional final appearances in Warlick’s six seasons, though the Lady Vols have lost in the second round of the NCAA Tournament the last two years. Tennessee finished 25-8 last season after racing to a 15-0 start. Warlick, a Women’s Basketball Hall of Fame inductee, was an assistant on former Tennessee coach Pat Summitt’s staff for 27 seasons. She is a former Tennessee player whose No. 22 jersey hangs from the Thompson-Boling Arena rafters.